Welcome to overreaction Monday, lines for the Tobin are forming to the right…and it looks like they’re handling the overflow to the Zakim. Yes, the Patriots stunk up the joint earlier on Sunday. Yes, the score doesn’t nearly do justice to how soundly they were beaten…And yes, we’ve seen this before. The Jaguars were by far the better team on Sunday afternoon, the most important thing was they completely dominated the line of scrimmage both offensively and defensively. When that happens, you’ll tend to get those lopsided scores. The team lost two of their best defenders to concussions, Trey Flowers and Pat Chung and Deatrich Wise left with a hand injury that looked serious. We’ll be watching how that plays out this week. Blake Bortles torched the New England secondary to the point we haven’t seen since Week 1 of last year. He completed 29 of 45 for 377 yards with 4 TDs and one interception. The Jaguars receivers consistently beat man coverage and when the Patriots went to zone coverages, the Jaguar receivers found wide open spots like it was a 7-7 practice session. We wrote here that the Jaguars would come out throwing and they did. The Patriots were playing to stuff the run and dared them to throw. They dared and won. Handily. The Jaguars played like this one like a perfect storm. The home opener, the heat and a very good game plan along with excellent execution doomed the Patriots. Containment and setting the edge? After a very good week of doing that against Houston, the Patriots did a terrible job of it this week. Offensively the Patriots couldn’t run the ball and the wide receivers struggled to get any kind of separation. Pats WRs had just 11 catches for 104 yards with two TDs, both from Chris Hogan. Keelan Cole alone had seven grabs for 116 yards and a score. That’s the kind of day it was all around. The Patriots won the toss and elected to receive, wanting to start fast in the humid, hot conditions with a heat index of around 107 at kickoff. The actually moved the ball and got into Jacksonville territory. Brady had Gronkowski on a crossing route with a lot of green in front of him. But the linebacker had a fistful of jersey and the white material stretched far out behind him, blending a perfect contrast to the green grass. Apparently it invisible to the naked (official’s) eye. On third down Brady’s pass was incomplete and he was pile driven to the turf…also with no call. On fourth down Stephen Gostkowski badly shanked a long field goal attempt. Jacksonville got the ball and promptly moved down the field with ease. Bortles made a beauty of a pass, one of several on the day, to Donte Moncrief in the end zone and although it was only 7-0 at that point, the writing was already on the wall. A Patriots three and out and another quick score and it was 14-0 and this one was already badly slipping away much like that woeful game in KC four years ago. At the end of the half, the Jags got a gift when they set a pick play and blocked Pat Chung far from the line of scrimmage and Austin Seferian-Jenkins was wide open to make it 21-3. But as much as the media is playing up the storyline that the Jaguars finished this time unlike the AFC Championship Game, it wasn’t for lack of trying to give it away on their part. Brady in his post-game remarks lamented the loss of chances and Jacksonville tried to give it away but the Patriots just weren’t having any of it. A fumble recovery off of D.J. Chark could only net three points. On the Jags next possession, Bortles made his only mistake of the day. He tried to force a ball inside with a pair of Patriots defenders in tight coverage the ball was deflected and Kyle Van Noy alertly picked it off. The Patriots were just 25 yards away from making it a one-score game. But instead Dante Fowler knocked the ball out of Brady’s hand and the Jaguars recovered, ending a big chance to actually make it a game. On the ensuing drive, James White’s dive for the first down marker was overturned by an official’s call. But Jacksonville tried to give it away again by jumping offside on the fourth down punt. But Brandon King, who is on the team strictly for his Special Teams’ ability stood there dumbfounded as if he were made of stone. If King touches the defender, it is a first down. These are the kind of mistakes the Patriots normally feast on. On the first play after the punt, Bortles hit Dede Westbrook with a short slant and he cut across the field, leaving a sea of white jerseys in his wake for a 61-yard TD. Thank you for coming, please put your seats and trays in the upright position. Still, Jacksonville attempted to play with fire. After Brady hit Chris Hogan for his second touchdown of the day to make it 31-20 with Jalen Ramsey in trail, the Jaguars started on their 15-yard line. Nathaniel Hackett who had called a tremendous game foolishly called a backward pass at the 10-yard line. They were fortunate that the play lost only five yards, had it hit the ground, anything could have happened. But didn’t. Regardless of the lost opportunities, this was a game, they had no business even being in at the end, never mind winning. Sony Michel – The Patriots rookie running back made his first appearance in a Patriots uniform after missing all four preseason games and the season opener. While there was certainly plenty of rust involved, it was good to finally see the rook on the field. He had just 10 rushes for 34 yards and one catch for seven, but he hasn’t played in a meaningful game since college. He looked good, albeit in a small dose, and should be a very dynamic member of the offense once his feet are under him. Jacob Hollister – The second-year tight end has missed some significant time with a hamstring issue and was also shaking off the rust as well as Michel. 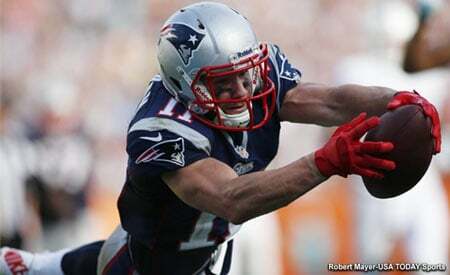 Hollister chipped in with three catches for 35 yards, which, if he can do consistently every week will eventually take a big load off of Rob Gronkowski. Tom Brady – Considering the pressure that the Jaguars put him under all game, the fact they got only two sacks speaks well of Brady’s ability to move in the pocket and get the ball out quickly. His numbers were pedestrian by his standards, 25-34, 234 yards with two TDs and O INTs. and he’d definitely like to have a few plays back, the throw-away where he had Patterson across the middle that looked like it could go for a TD was one. But overall, he hung in and somehow kept the team in the game late when they had no business being there. Offensive/Defensive Lines – Take your pick, both were awful and were dominated at the point of attack. Plain and simple. After a very good effort on Week 1 on both sides of the ball, the offensive and defensive lines took a huge step back. No sacks, very little pressure and not setting the edge are recipes for a loss. The Jags OL was getting a great push and the NE DL was consistently on roller skates. The OL couldn’t get anything going in the running game and the pass protection was iffy all game long. Ja’Whaun Bentley – The rookie linebacker has been so impressive thus far in his short NFL career had a rough afternoon, especially in coverage. He was far from alone in that aspect but after looking so strong initially, this was a step back for the big, rookie LB. This is a perfect learning experience for the young player and the coaches will point out where the mistakes were, and they were all correctable. Eric Rowe – No one could have wanted to get on a Southwest Air commercial than Rowe yesterday “Want to Get Away?” Rowe had one of those days that everyone has and tries to put behind him as quick as possible. The Jaguars picked on Rowe everytime they threw the ball in his direction. Keelan Cole smoked Rowe for a TD that made the score 14-3 and Belichick quickly sat the veteran. That wasn’t a good sign for the rest of the day. Good thing for Rowe was that Bortles and the Jags were equal opportunity abusers, they picked on everybody. So, we’re well used to early season stinkers and this was a stinkeroo and the problems that we saw on Sunday are all correctable. As we said at the outset, this is overreaction Monday, the “AFC goes thru Jacksonville” talk in Week 2 is laughably ridiculous. There are 14 weeks left in the season and as we’ve seen many times, this team will get it straightened out. Watch the tapes, fix the errors and then bury them with the game balls at the back of the practice field. 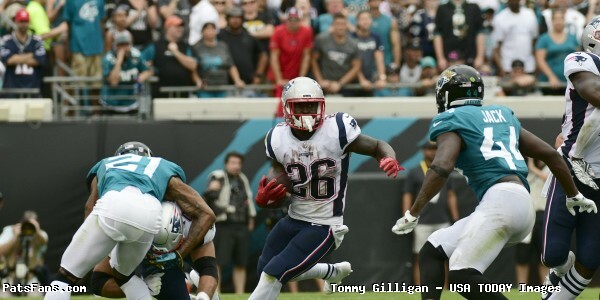 This entry was posted in 2018 Patriots Regular Season, NFL Commentary, NFL News, Patriots Commentary, Patriots Injuries, Patriots News and tagged 2018 Patriots season, Bill Belichick, Blake Bortles, Chris Hogan, Corey Grant, Dante Fowler, Dont'a Hightower, Jacksonville Jaguars, James White, Keelan Cole, New England Patriots, NFL, Patriots, Patriots edge rushers, Rob Gronkowski, T.J. Yeldon, Tom Brady, Trey Flowers on September 17, 2018 by Steve Balestrieri.